I’m a list person. I write lists to help empty out my head. The idea of course, is to get my jumbled thoughts on paper, thereby freeing up precious mental space for something else. I keep an ongoing work related notebook, and at the back of each of these books are pages and pages of neat, tiny lists. And, yes, I even break my lists into sublists. Things I need to do for work, people I need to talk to, items I’m on the look out for, errands I need to run, perfect dinner party menus. You name it, I can subcategorize it. I can’t help it. It’s genetic. But mostly I write lists to help maintain an illusion of control. That said, I’ve learned to be careful when making bee yard lists. Yes, there are always routine jobs that need doing, but I’ve come to understand that most of the big bee jobs are unpredictable. You might know certain tasks are impending, but generally there are so many variables, it’s hard to say exactly when they’ll need doing. Making them difficult to plan for. This is hard for me. Which is why I couldn’t stop myself from writing “split hives” on a list a few weeks ago. The problem is that as a beehive grows in population, it can start to feel a little cramped inside. 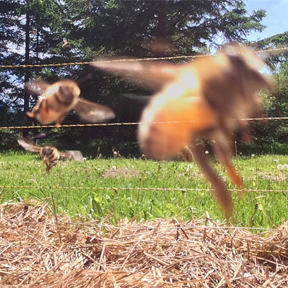 At a certain point, the bees will take matters into their own hands and split themselves into two populations. They do this by swarming. Which means that half of the hive leaves (with half the honey stores) to find a new home. The really rad part of all this is that bees have the ability and wherewithal to raise a new queen for the hive when they need one. All fertilized eggs that the queen lays develop into female worker bees, UNTIL the workers decide to provide the growing larvae different nutrition. Just that slight change in diet changes larvae from a developing worker bee into a developing queen. Prior to swarming the bees will start raising a handful of queens, just to be sure at least one survives. 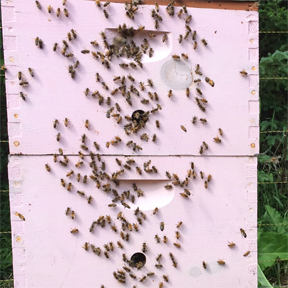 The bees know (miraculously) that it takes 21 days for a queen to fully develop. Shortly before the new queens begin to hatch, roughly half of the bees will fill up on honey, surround themselves around the old queen, exit the hive, and take off to a new home. Like clockwork, the queen cells in the hive begin to hatch. The first queen out wins, as she will promptly begin to destroy any unhatched queen cells. Her second task is to exit the hive – her one and only foray into the world – to be mated so she can return and resume the role of egg layer for the good of the hive. Problem solved. As a beekeeper though, an even better solution is to keep the exiting swarm of bees in your possession. There are two ways to accomplish this. Catch the swarm before it sets off for new real estate and install them into an empty hive, or manually split the hive into two BEFORE they get the notion to do it themselves. Method one requires vigilance and a healthy bit of luck that the swarm actually lands where it’s retrievable. But method two, method two, you can plan for. I knew that Hallie Frances’ hive was strong coming out of winter. And she didn’t miss a beat with resuming laying eggs this spring. So I also knew it was only a matter of time before they would start to think about swarming. Hence my preemptive list item. I was going to beat them to the punch. My plan was to pick a fine day where I had plenty of time to more or less dissect Hallie’s hive. 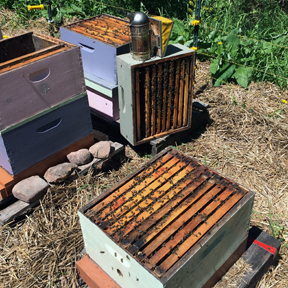 I’d find the queen, isolate the frame that she was on, and then hand pick an assortment of ten other frames – a nice mix of honey, pollen, capped brood, and fresh eggs – to create a second hive. Then I’d put the frame with the queen on it back into the the initial hive and reassemble it with empty frames to replace the ones I’d removed. The new hive would get to work raising themselves a fresh queen, and Hallie’s hive would have their breathing room. It sounds so perfect, doesn’t it? Which is why I looked at my list one fine day and decided the time had come. But here’s the thing. Nothing went according to plan. In three full boxes of bees, I could not find Hallie to save my life. I always find the queen. Always, except for when I’m looking for her. And halfway through the job, my overtired back decided it was done lifting heavy things. Like done, done. As I was looking around at the mess of boxes and frames I’d created, dubious that I’d find the energy to put it all back, a rogue thunderstorm rolled in on my perfectly fine day. And on top of all that, this very full hive of bees showed absolutely no signs of swarming (they’ll often pre-build telltale queen cells). Everything last little thing was telling me that this hive simply did not want to be split. But after a few days, I realized that it wasn’t actually a bee flop at all. The bees were fine. It was just a list malfunction. As is often the case, it took three boxes of bees to remind me of something big. My lists are futile. They may make me feel more on top of things, but not necessarily the things that count. As much as it makes my precise type-A personality squirm, deep down I know that there’ll be no tally of how many things get crossed off my tiny, neat lists. Life is much bigger than that. Thank god.